When a local manufacturer required assistance with a safety upgrade, who should they approach but the Southwest's Machinery Safety Experts? Read on to see how Rowse helped to safeguard their premises, ensuring that machine operators were able to continue working with older, yet still safe machinery. A local manufacturer possessed a machine that had been in service for many years. Despite its age, this machine was a factory workhorse and could still perform the required tasks at the same speed and production quality as much newer and more costly machinery. The client wished to prolong the machine's active life but needed to ensure that it continued to operate safely. 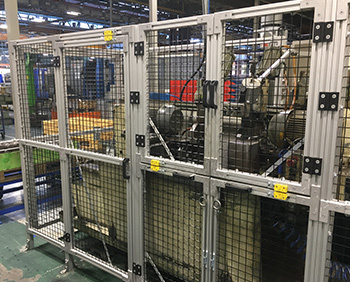 The customer had previously carried out a risk assessment analysis on the machine, which highlighted that it needed guarding to prevent the operator accessing hazardous parts during its operation. How could this be done most efficiently and cost-effectively? 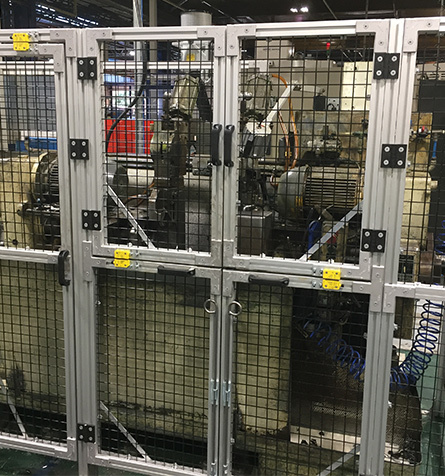 We suggested custom-designing a safety cage to safeguard the machine, using ABB Safety Fencing. Rowse is a safety partner of ABB, and we have used their range of ABB Jokab Safety Products and Safety Fencing systems for many years. We attended the site with Mathew Swan, ABB's Safety Specialist, to view the machine and discuss the brief in greater detail. We considered the safety and operational requirements of the machine, in dialogue with the Production Manager, the Health and Safety Officer and the Engineering Department. While we were on site, we were also able to provide the customer with some legislation updates, and guidance on several other potentially hazardous areas. After these initial discussions, Rowse then carried out its own assessment of the machinery. It was felt that the best solution would be to provide a complete safety perimeter guarding system around the machine, with monitored access doors and hatches for loading/unloading, and any necessary routine maintenance. With the information obtained from the site visit, we then produced a proposed design drawing using ABB's AutoCAD-based SafeCAD software. This allows for the rapid creation of 3D design drawings, which can then be used for product installation. SafeCAD software also produces all required back-up documentation such as cutting and material lists. 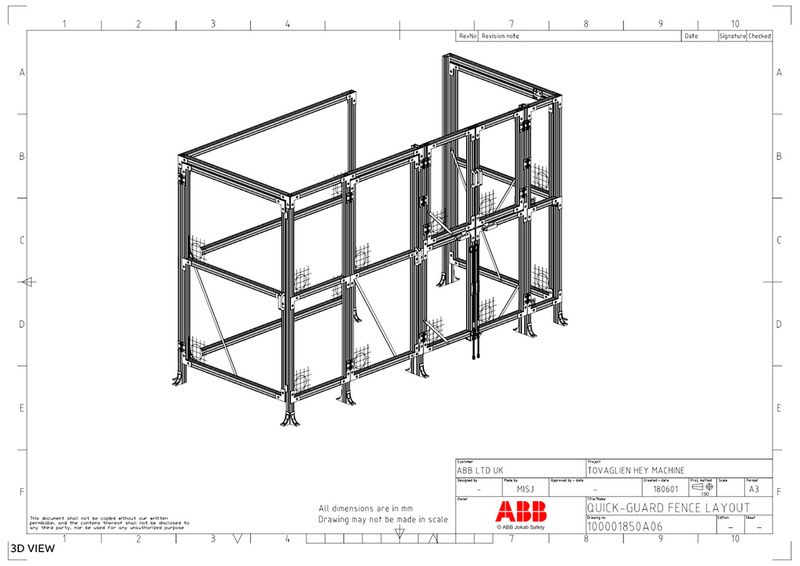 Our proposed design was based on the ABB Jokab Quick-Guard range of Safety Fencing products, and consisted of aluminium profiles, patented brackets, mesh, and solid or noise reduction panels. The Quick-Guard range is infinitely versatile and offers no build limitations. Its patented screw-lock system means that all aluminium profiles have a straight cut and no holes need drilling in them, making both the assembly of the fence and any future modifications to it very easy. After submitting the initial designs to the customer, a few areas needed modification, but these amendments were quickly submitted on the SafeCAD software and the designs subsequently accepted. Once the mechanical designs had been finalised, we were then able to proceed with designing the electrical requirements of the Safety System. For this we used ABB's Eden range of non-contact safety switches in conjunction with an ABB Sentry Safety Relay. Rowse was also asked to manage the mechanical installation of the Safety Fencing. It was decided to do this during the annual factory shut down, so as to avoid any negative impact on production. The fencing system was delivered to the site ready for the installation date, together with the safety-related electrical components. Due to the clever design of the Quick-Guard system, the installation was very straightforward, and the fencing was assembled and fixed in position ready for the customer to carry out their own electrical installation. When the factory re-opened for business, the machine was secured and production could resume. Rowse specialises in the supply and installation of many safety products, and is pleased to assist our customers with ensuring their safety.